GEO Surf Review – Must Have For Affiliates! As an affiliate that is smart and wants to promote internationally, it’s very hard to see the offers when your based in the USA. There are free proxies online, but if you’ve tried them than you know that they are super slow and highly unreliable! Most of them spawn multiple pop ups and cause your browser to crash. Sometimes they don’t even load fully! Now what is your solution to this you ask? Well what if I told you that there’s a plugin available that installs on your browser and you can easily choose which Country you want to view the website in! The solution is finally here, it’s called Geo Surf, and I’m totally hooked on it! Not to mention there’s a free 5 day trial you can take advantage of right now! They have quite a few plans from the normal sized affiliate to business accounts for multiple users! If your just an affiliate marketer like me, then I’d suggest you go with the Starter or Basic plan first then move up if needed. One feature however you may want to consider is the Enterprise plan even though you may not need it, because it has mobile features that the other one simply do not. If you are a Mobile (WAP) marketer and want to view landing pages that are mobile based using a mobile browser in a location that is not your own, then the Enterprise is what you need. Once you select your plan and sign up for your free trial, you will be given access to download the toolbar, it works with IE and Firefox so you shouldn’t have any problems installing it. Once I got it installed, just took around 30 seconds :), I was already testing out different GEO locations for quite a few affiliate offers that I had trouble accessing and now I can finally check out how the landing pages look for those offers. Another really cool idea to do is to search Google for your niches and keywords that you want to rank for, and see what the results are. 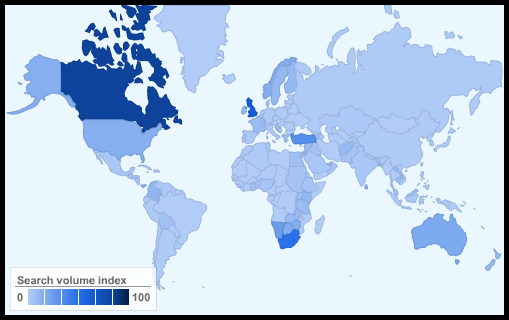 Ever wondered how your ranked in Canada or United Kingdom for your main keywords? With this tool you can do just that! Pro Tip: Do you make money on Facebook? Why not target international markets? Well with this tool you can easily create a international account, for example Germany, and spy on German ads! Simply rinse and repeat to make yourself richer. Watch GEO Surf Live In Action! Still want to see how this works before you give it a try? Well check out the video below for a complete walkthrough of the whole process! It simply doesn’t get any easier than this to switch from IP’s to IP’s! Start Your Free Trial Of Geo Surf Today! Another Google July PR Update – Got PR 4!